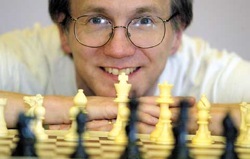 My chess catastrophes continued this weekend at the CalChess Labor Day Classic. I scored Â½ point in the first 4 rounds (one draw, three losses) and was so discouraged that I felt it was necessary to withdraw early. I couldn’t bring myself to get up early and drive 1Â½ hours to San Francisco and 1Â½ hours back, just to play two meaningless games at a time when my chess game is obviously so seriously out of whack. Cailen Melville’s invention. So far my record with it is one win, five draws, and no losses. But that hides the fact that in five out of six games I have gotten serious advantages as White. The trouble is that with the symmetric pawn formation, if you don’t take advantage of your opportunities, it tends to get drawish. This year I’ve been very bad at seizing opportunities. But as long as they continue to be there, I intend to keep playing this line. For Black, this variation is the perfect punishment for choosing the lame and oh-so-fashionable Slav Defense. Black has no chance of winning, and the question is just whether he will draw after protracted suffering. I noticed that Perepelitsky, in the next round, chose a different defense to 1. d4 as Black. Forgive my lack of comments, but I wanted to get to the first critical position as quickly as possible. So far the game has been as easy as duck soup for White. Unfortunately, this worked against me on the following move, because I continued playing on “autopilot” instead of thinking about the position. When Black played 18. … g6 I thought, “Okay, my queen isn’t going to need the d3 square now, so I will route my knight through d3 to c5 or e5.” I took only 3 minutes on this move, and did not even look at the correct line for White. I should have focused on that weak square on g6. I did think about it a little bit, but only long enough to convince myself that sacrificing a piece there would be premature. What I should have asked next was this: “Is there any way to make the g6 square even weaker?” Indeed, there is! 19. h4! would have been a very strong move, and in my analysis this morning I couldn’t find any satisfactory answer for Black. If 19. … h5 (as Black played later in the game), now 20. Nxg6 fg 21. Bxg6 looks good for White, because he will win a third pawn for the piece, the pawn on h5. On the other hand, if Black allows White to play h5 himself, then as Jesse Kraai is fond of saying, “It’s a bad business.” He won’t be able to defend the pawn on g6, and if he replies … g5 then White’s threat to penetrate to h7 with his queen becomes very dangerous. I would venture to say that White is strategically winning. But instead I unthinkingly played 19. Nd3 a5 and only now it hit me, “Oh wait a minute! I could have played h4!” This is Exhibit A for Bad Chess: seeing the right move one move too late. I decided to play it anyway: 20. h4. It’s still good, but not as good as it could have been with the knight on f4. Now the game continued 20. … h5 21. g3 b4 22. Nc5 Ba6 23. Re1 Na7, bringing us to our next key position (diagram). Here is Exhibit B of Bad Chess. I played the ultra-lame move 24. Nxa6?, exchanging my beautiful knight for Black’s do-nothing bishop. 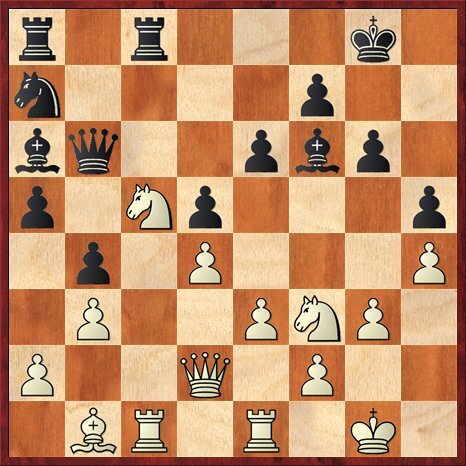 My opponent asked me after the game, “Why did you take that bishop?” The real reason is not that I was afraid of the bishop so much, but I was afraid of the knight and what it could do if it got to c3. (In fact, the knight and the bishop do in fact combine to create threats of Ne2+ if White isn’t careful.) 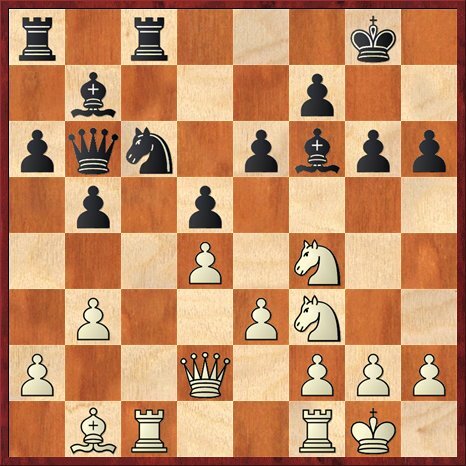 So I took the bishop in order to control the knight, by playing Bd3, where I could either take the knight on b5 or else let it penetrate to c3 and then show that it is only superficially impressive on that square. Nevertheless, after the text move, 24. 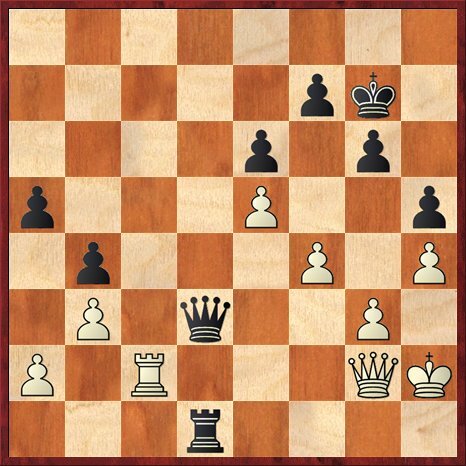 Nxa6?, it is clear that White has no claim to an advantage any more, because he has traded his best piece for Black’s worst piece. Any master strategist, from Jeremy Silman to Jesse Kraai, would tell you that I should not even have contemplated such a move. Instead, 24. Nd7 begs to be played, but I could not convince myself I had an advantage after 24. … Qd8 25. Nxf6+ Qxf6 26. Ne5. Black plays 26. … Nb5 and here comes the knight, to c3 and then maybe e4. But I should have considered one more possibility: 24. e4!? This is very timely, because both of Black’s last two moves (… Ba6 and … Na7) have removed pieces from the center, so a blow in the center is the natural reaction. In fact I think White has a great game after 24. e4 de?! 25. Bxe4. Probably Black’s best is to continue with his plan: 24. e4 Nb5, but now 25. e5 and White’s position on the kingside is getting more menacing (though I don’t see any clear breakthroughs yet). Once again, I did not even look at the key move. This is becoming a pattern: not looking at enough candidate moves, even though I had plenty of time. We have just made it past the time control, and so now I have all the time I need to think. So did I think? No! In less than a minute, I whipped out the appallingly bad move 31. f4?, after which White clearly stands worse. All the king’s horses and all the king’s men should not have persuaded me to make this move, which loosens my kingside in the worst way. 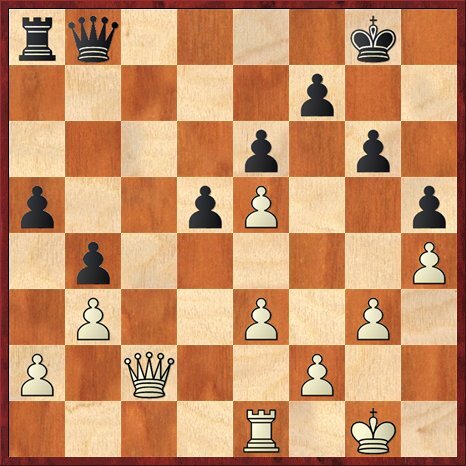 Why not simply defend the pawn with 31. Qb2, preparing to sink the queen on d4? White may not be better, but at least he’s not worse. The reason I didn’t play 31. Qb2 was absolutely absurd. I was still thinking, “I can’t move the queen off the c-file, because Black will claim the file.” That is, I forgot that Black’s queen on b8 interferes with the rook, and so I “thought” that if I played 31. Qb2, Black would play the illegal answer 31. … Rc8. Exhibit D for Truly Awful Chess. I intended to play 39. Qc4, but then I touched the wrong piece. I’m not sure if it really matters, though. And now I did my second smart thing in a row: I offered a draw. The time situation here was that I had about 25 moves left for the rest of the game, and Perepelitsky had about 15 minutes. He sat and stewed for about 9 minutes, but there is no way for Black to break through. White just shuffles his pieces on the second rank. The only way Black could make progress would be to try to bring his king up, but that would almost certainly lead to an instant draw. And Black can never contemplate trading rooks and queens, because the king and pawn endgame is always at least a draw for White, and sometimes even a win. I could tell that Perepelitsky hated the idea of taking a draw, when he had come back so dramatically and I had screwed up so badly. But with his clock ticking down to 6 minutes, he had to face the inevitable. After the game, the first thing he said to me was, “You missed so many wins.” Actually, I’m not sure I did. He thought I had lots of chances to sac on e6 or g6, but as far as I can see, the only time when I was really close to winning was when I missed 19. h4. Also, 24. e4 would have been interesting but I don’t see it as an open-and-shut case. What do you think, esteemed readers? you seem to have a hard time lately! though i think it’s unfortunate that you withdrew, because you could have taken the chance to try to deal with your chess thinking problems, and not just leave a bad feeling about the tournament. but if you know you can’t calm down so quickly and get out of this spiral, then probably withdrawing is reasonable, i just know personally that i wouldn’t do it in this situation. but don’t lose the spirit, there’ll be a light at the end of the tunnel and better chess times for you ahead! Thanks for your support! In general, I think withdrawing is a bad idea, and for many years I never withdrew from a tournament, as a matter of principle. I remember one tournament when I started out 0-3, but didn’t withdraw and finished with 3 wins in a row. I didn’t win a prize and I still lost rating points, but I was proud of not giving up. But I have withdrawn from a couple now, and this time it seemed to me that I really needed a break. My self-destructive tendencies (in chess) have gotten so strong that I just need to walk away for a while. I am going to skip what would normally be my next tournament (the Western States Open in Reno — ironically, the tournament where I did great last year and won the under-2300 prize). So, no more tournament chess for me for the rest of the year. I will still keep studying, though, and start off the new year, 2011, playing in the Berkeley International. Sorry to hear about your tournament disaster. It does happen to everyone at least once, and to many of us more frequently than that. My last tournament also went badly; I finished on 3.5/6 which sounds OK but it cost me nearly 30 rating points and I usually average around 4.5/6 for these tournaments (it’s the tournaments we play at Arcadia Chess Club). I even got mated in one game against a 1600 player that I outrated by nearly 400 points. I didn’t even see the mate! That’s how badly I was playing. It was embarassing, to be honest, but I try to view each loss as a learning experience And you know what? This tournament I am doing much better, on 3/3 so far, and beat a strong expert in the previous round. In fact, I already gained back the points I lost from the last tournament (so far!). I am trying to get better at playing golf. I mention that because the two games/sports have more in common that you might think. With my golf game, for now I am not concerned about the results. I am not focused on the score I make for the round or even what I score on each hole. I am concetrating on my technique, my swing, and just hitting the ball consistently well. It will eventually yield results and perhaps later I will pay more attention to my score. I think taking a break from chess for the rest of the year is a good idea. At least, taking a break from tournament play. Again, like golf, some days you just aren’t “feeling” it, play horribly, and wonder why you bothered turning up in the first place. Things will turn around for you, I’m sure, perhaps after this well earned break from chess.